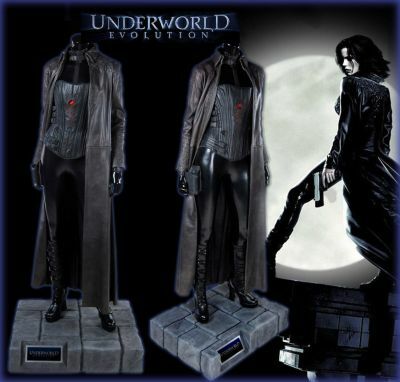 This is Selene’s (Kate Beckinsale) hero costume worn in the 2006 action film Underworld: Evolution. This style costume can be seen throughout the film as Selene and Michael (Scott Speedman) are searching for the truth behind their bloodlines. The skintight black bodysuit is made of PVC and has a zipper closure from the neck to the lower torso with black leather zip-up arm gauntlets. The corset is leather and features a lace up back with black laces as well as two rear zippers running from top to bottom and eight leather straps that extend around the side and clip to the corset’s front. One black gun holster attached to the outside of the upper thighs using small, high powered magnets and mounted on a themed display of faux rocks from the buildings Selene visits throughout the film. This particular costume can easily be matched and seen on screen by the stab wound in the center of the corset when Marcus begins to go into combat with Selene and is enraged when a resurrected Michael fights and kills William. Marcus then drives a wing talon through Selene who survives due to her having previously drank of Alexander's blood.